Measuring 4.06 x 2.69 mm with height profile of 1.60 mm, DSMZ Z-Foil surface-mount voltage divider provides matched pair of Bulk MetalÂ® Z-Foil resistors in single, surface-mount package. It features TCR of Â±0.05 ppm/Â°C from 0-60Â°C and Â±0.2 ppm/Â°C from -55 to +125Â°C, PCR tracking of 5 ppm at rated power, tolerance match of Â±0.01%, and load life stability of Â±0.005%. Unit also features resistance range of 100 W to 10 kW per resistor and offers 1-10 ns rise time. MALVERN, PENNSYLVANIA October 19, 2007 Vishay Intertechnology, Inc. (NYSE: VSH) today announced the new DSMZ ultra-high-precision Z-Foil surface-mount voltage divider, which features TCR of ±0.05 ppm/°C from 0°C to +60°C and ±0.2 ppm/°C from -55°C to +125°C, PCR tracking (Delta R due to self heating") of 5ppm at rated power, tolerance match of ±0.01%, and load life stability of ±0.005%. The new DSMZ voltage divider is built on Vishays breakthrough "Z-based" foil technology, which outperforms all other resistor technologies available today for applications that require ultra-high precision and stability. 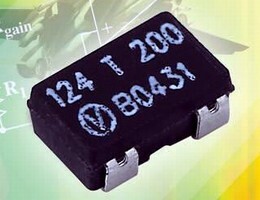 Greatly reducing the resistive components sensitivity to ambient temperature variations (TCR) and applied power changes (PCR), Z-Foil improves stability by an order of magnitude compared to any other resistor technology, allowing designers to guarantee a high degree of accuracy in fixed-resistor applications. The DSMZ voltage divider provides a matched pair of Bulk Metal® Z-Foil resistors in a single, surface-mount package with dimensions of 4.06mm by 2.69mm and a height profile of 1.60mm. Device features include a load-life stability of ±0.005% for 2000 hours at 70°C; a resistance range of 100 W to 10 kW per resistor; a power rating of 0.05W per resistor at 70°C; current noise less than -40dB; and can withstand electrostatic discharges (ESD) of 25,000V. The DSMZ offers a fast rise time of 1 to 10ns (depending on resistance values) without ringing and features a non-inductive, non-hot-spot design. Applications for the new DSMZ voltage divider will include instrumentation and differential amplifiers, bridge networks, radio arms in bridge circuits, medical and test equipment, and military and aerospace systems. Offering better performance and more efficient use of board space than discrete resistors and matched pairs, the DSMZ is also available in custom versions to meet non-standard technical and application requirements. Samples and production quantities of the DSMZ voltage divider are available now via Vishays Fastlane Prototype Service, with lead times from two to five days for prototype samples and six weeks for production orders. Pricing for U.S. delivery begins at $7 per unit with two resistors.